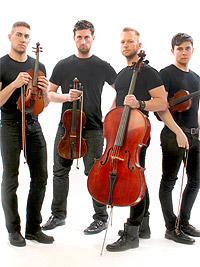 Well-Strung: the Singing String Quartet will return to Provincetown’s Art House theater this season. Since the group’s 3-month run at the venue last summer, they’ve been on a roll - with two recent hit New York productions Off-Broadway and their first album released this spring. Well-Strung will debut an all-new show for the summer, running from June 30 – Sept. 1. It is directed again by Donna Drake, and will feature new arrangements of songs by Pink, Kelly Clarkson, Taylor Swift and Third Eye Blind among others as well as new material written by Jeffery Roberson (aka Varla Jean Merman). For tickets, please visit www.ptownarthouse.com or call 800-838-3006. A hit last summer at this theater for their unique ‘mash-up of string quartet and boy band,’ the group features classical musicians who sing, putting their own spin on the music of Mozart, Vivaldi, Ke$ha, Pink, Adele, Lady Gaga, Britney Spears and more. They are Edmund Bagnell (first violin), Christopher Marchant (second violin), Daniel Shevlin (cello) and Trevor Wadleigh (viola). Music arrangements are by David Levinson with additional arrangements by Daniel Shevlin. The show was directed by Donna Drake, conceived by Christopher Marchant & Mark Cortale and written by Ms. Drake & Mr. Cortale, with additional material contributed by Jeffery Roberson. Immediately after their upcoming P-Town run, the foursome will continue their career hot streak with a debut on London’s West End in September at the Leicester Square Theater. The group first began performing together in a workshop production of the show directed by Ms. Drake at Ars Nova in NYC on Feb. 28th, 2012. Musical arrangements were by Mr. Levinson with additional arrangements by Mr. Shevlin. That same show sold out at Joe’s Pub in May of 2012 before having an extended run last summer at The Art House in Provincetown, MA and playing Off-Broadway at the Marjorie S. Deane Little Theater last fall. The group returned to Off-Broadway for the first three weeks of March, 2013, and sold-out the Highline Ballroom for one night in early May. The foursome’s debut album was released on Twist Records on February 28, and was produced by Matt Farber (Founder of LOGO Network) and Mark Cortale. Edmund Bagnell (First Violinist) played Tobias in the 1st National Tour of "Sweeney Todd" directed by John Doyle. He was most recently seen this fall in Gian Carlo Menotti’s “The Medium” playing the role of Toby opposite Varla Jean Merman. Recent regional theater credits include Charlie Brown in "You're a Good Man, Charlie Brown" (Summer Theater of New Canaan), Charlie in "The Big Holiday Broadcast of 1959" written by Joanna Gleason (Fairfield Theater Company), and Oramel Howland in "The Great Unknown" written by Jim Wann ("Pump Boys and Dinettes") and Bill Hauptman ("Big River") as a part of NYMF. Donna Drake (Director) has appeared in the original Broadway casts of "A Chorus Line," "Sophisticated Ladies," "Woman of the Year," "The Wind in the Willows," "5678-Dance," "It’s so nice to be Civilized" and the original production of "The 1940s Radio Hour." She was an Emmy nominee for "Dear Alex and Annie," and received 4 Drama Desk Nominations, a Mac Award Nomination and a Theatre World Award. She also directed John Tartaglia’s "Imaginocean," which ran Off Broadway at New World Stages. David Levinson (Arrangements) collaborated with Stacey Weingarten and Donna Drake on "Les Enfants de Paris" (world premiere NYMF 2011). David is also currently working on music and lyrics for "Boys Lost," "The Elliot's," and "Who Is Prester John?" which are in development. Chris Marchant (Second Violinist) grew up singing and playing violin, but was not involved with theater until the end of his studies at Malone University in Canton, OH. Since then, he has been involved in numerous productions utilizing his multi-talents as a vocalist, actor, and musician. Career highlights include Tobias ("Sweeney Todd," National Tour), violinist ("Spring Awakening" National Tour), Dennis ("Sanders Family Christmas"), and "Naked Boys Singing." Daniel Shevlin (Cellist/Arrangements) appeared off-Broadway in "The Sandbox" written and directed by Edward Albee, toured the U.S. and Asia in productions of "Rent" and "Cabaret" (Studio 54 version), and has worked regionally as both an actor and cellist in many theaters including the Arvada Center (CO), The Maltz-Jupiter Theatre (FL), Riverside Theatre (FL), Mason Street Warehouse (MI). Trevor Wadleigh (Violist) is from Seattle and currently a member of The String Collective of New York. He has taught viola at the University of Puget Sound Community Music Community and is also a co-founder of the Puget Sound Animal Rescue. Mark Cortale is the Producing Artistic Director of The Art House. In his inaugural season in 2011, he founded the Broadway @ The Art House series with Seth Rudetsky, which this summer of 2013 will present Broadway superstars Patti LuPone, Chita Rivera, Sutton Foster, Audra McDonald, Megan Hilty (of TV’s “Smash”), Megan Mullally (of TV’s “Will & Grace”), Christine Ebersole, Joanna Gleason, Sam Harris and Marilyn Maye in addition to other national-level music and comedy programming. He is currently producing Seth Rudetsky’s new reality series and other Broadway-themed entertainment that can be seen at www.SethTV.com. He also co-wrote and produced Well-Strung’s runs this past winter and fall at New York’s Marjorie S. Deane Theater. Mark produced the feature film "Varla Jean and the Mushroomheads," which played the 2012 festival circuit with a screening at Frameline in San Francisco. Mark also premiered the Broadway @ series this season in New Orleans, in Australia with Megan Mullally, on London’s West End this month with Patti LuPone at Leister Square Theater, and will debut as well in Santa Monica, CA in fall of 2013. The Art House is wheelchair accessible.